I wasn’t motivated to get up super early, even to watch the sun rise, as I had less than 4 miles to get down to the road. 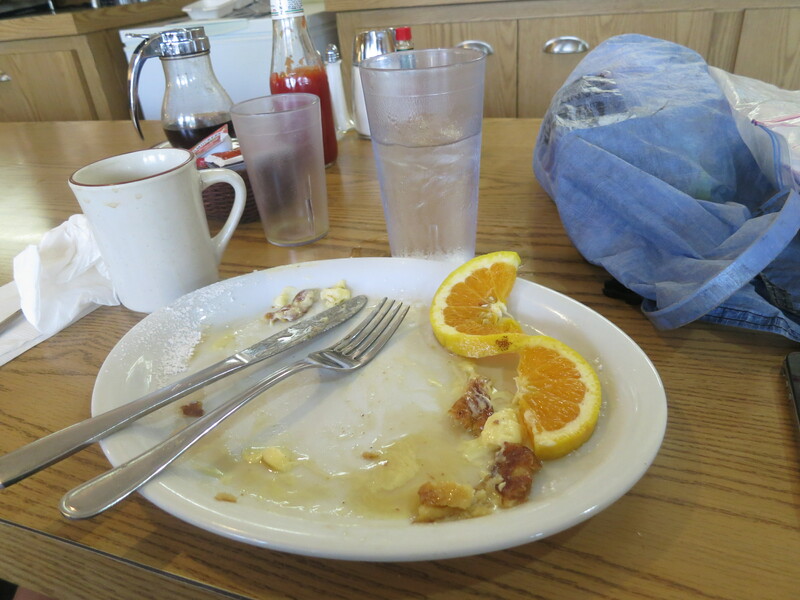 I ate a quick breakfast, took a couple of pictures of the scenery in the daylight, and got going at 7:24. I had to first finish the climb and then make my way down the mountain. As I neared the road, two women, two men, and a dog named, Luna approached me at the start of their hike. We chatted for a few minutes and then I finished up the descent, arriving at 8:42. There was a bulletin board in the parking lot, and while I wanted to get to the road in order not to miss one of the few passing cars, part of me thought I should see what was posted. Just then, a blue car went whizzing past. No!! I walked over to the road, took off my pack, and waited…and waited… and waited. Three cars went by in the other direction and although they were going the opposite direction, each driver waved. No one was headed the way I wanted to go! After about 35 minutes, a white truck headed in my direction! I stuck out my thumb, but the driver put his hands up as if to say he couldn’t help! Really? I had read that this road had very little traffic, but that all of us would eventually get a ride. Being Sunday, there were almost no cars headed into town. The horizon was very hazy and I wondered why I couldn’t see the mountains clearly. At last, I saw a white pick-up truck pull over at the trail head across the road. A bunch of hikers were being dropped off! I put on my pack and headed towards it, assuming the driver would be going back to town. I didn’t know any of the hikers, but they were all in a good mood and were thanking the driver for the cookies he had given them! 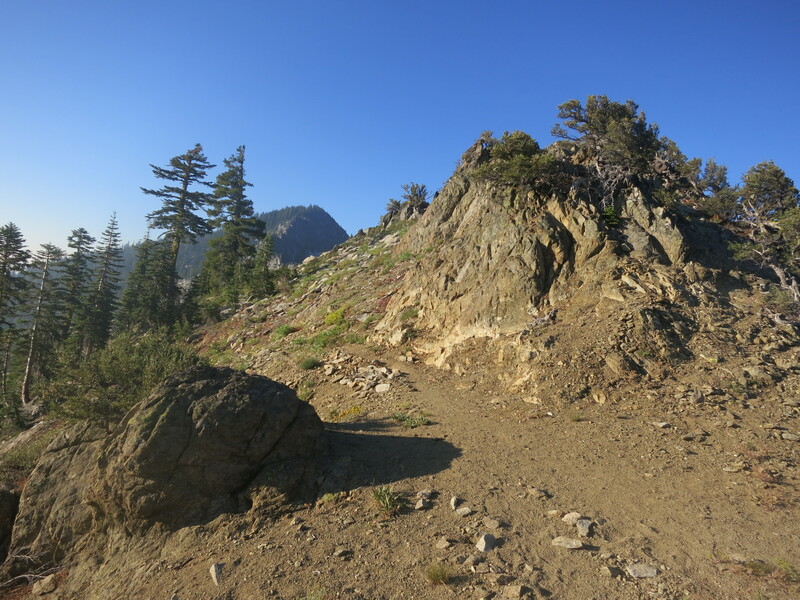 Once everyone was set, I put my pack in the truck and headed down the mountain with Fred. I didn’t understand exactly who he was or how he was connected to the Hiker Hut, but he was a very nice man and he told me about the fires in the area along the way. There were currently a large number of them spreading in Northern California and Southern Oregon, and the worry was that they would come together and create an even more massive fire. 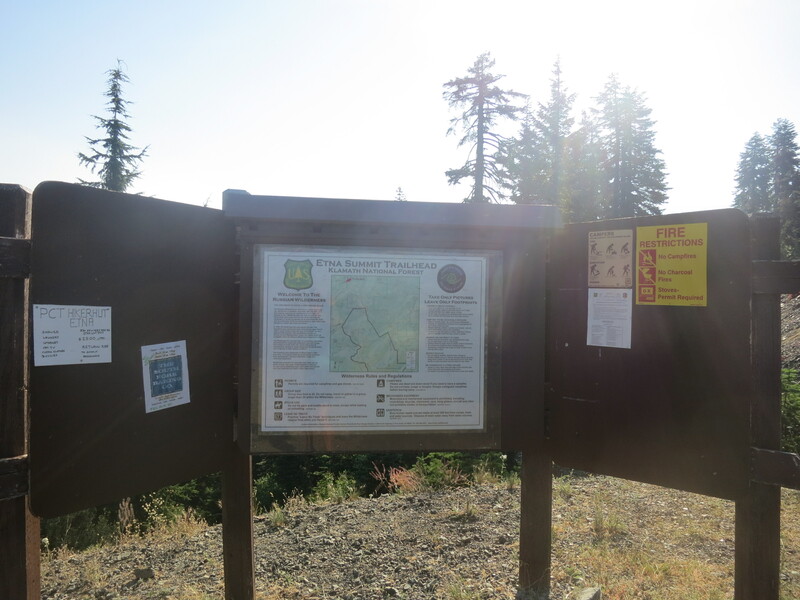 So far, none of the Northern California fires were threatening the PCT, but Fred said that there was one happening around Crater Lake, where I was soon headed. He didn’t know how close to the trail it was or how much it was contained at this point. 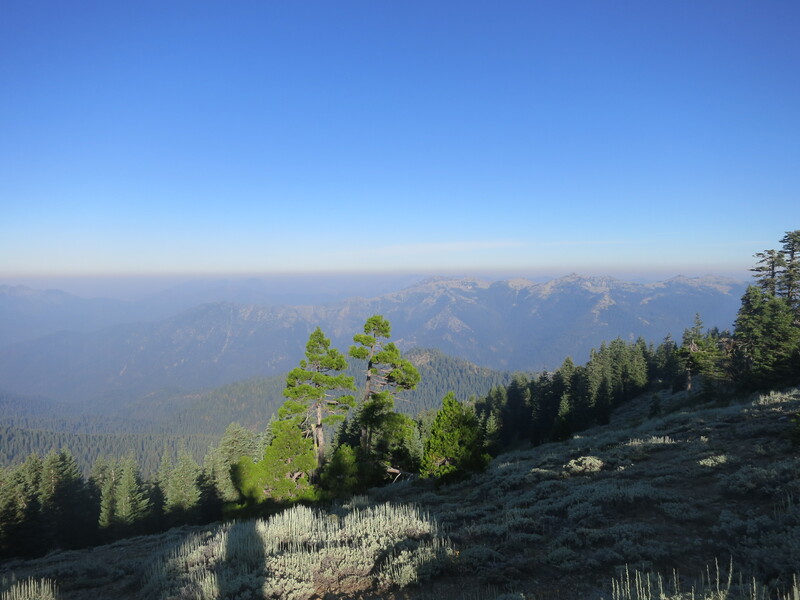 As we neared town, he asked if I was staying at the Hiker Hut. I didn’t know. Part of me wanted some privacy, and I thought the motel would be better, but not spending so much money was also appealing. 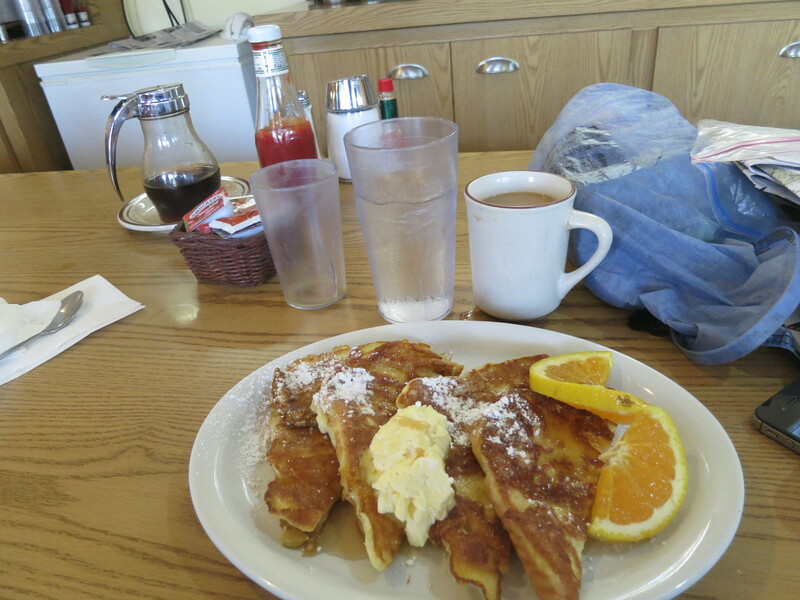 The hiker I had run into yesterday told me that Bob’s Ranch House had great breakfasts, so I asked Fred if he could take me there while I thought about it. We drove past the Hikers Hut and I saw a bunch of hikers hanging out, including Shyshinka. Fred laughed and told me that he was desperate to visit the commune nearby and see what the hippies were like. He had asked Fred for a ride, but Fred tried to dissuade him. We drove on and I asked about the motel. Fred said it was small and often booked up if there was an event in town. He dropped me off at Bob’s and I told him I would probably see him tomorrow morning! I left my pack at the entrance and took a seat at the counter, since the tables were full. I had an avocado, bacon, tomato, and jack cheese omelet, with a side of fruit, and wheat toast, along with an orange juice and coffee. I was glad for the time alone to decompress a bit. The waitress was very attentive about re-filling my coffee cup, which I really appreciated. I texted my Swiss friend to tell him I was now in town. He asked if I was going to head back out to the trail after breakfast! (I just got here!!). I decided to order some french toast after a little break and ended up eating it all! For once, I felt like a normal thru-hiker! I arrived at the Hiker Hut and found my two packages on the porch. I decided I would stay there after all, and went into the office to check in and pay. For $15, I could camp in the backyard, and do my laundry for $3 more. A hiker was sitting at the table in the front lawn and said hi to me. He said his name was Slack and that he had seen me in Sierra City, where I was not looking good. He said that I looked much more lively now and that he was happy to see me that way. (I can look lively? ?… That made me feel happy in itself!!). The shower was free, so I took the opportunity to get clean before other people arrived and wanted to use it. Braveheart was inside. He had stayed in the bunkroom the night before and was planning on staying tonight, as well. When I finished showering, I heard a familiar voice outside, although I could not immediately place it. It turned out to be Fun Size!! We were finally reunited after not having seen each other since Old Station, over 200 miles ago! This morning, he had somehow hiked a ridiculous 22 miles to get here, passing 11 other thru-hikers along the way! After he got settled in, we decided to head back into town to get some lunch together. He wanted to take the loaner bikes, but I preferred to stay on my feet- even if I had to walk a mile to get there. When I was twelve, I had an accident in which I flew over the handlebars of my bike, and ever since, I have been too scared to get back on one! FunSize said that he would be finished with his milkshake by the time I got there if I walked! So, I stood staring at the row of bikes with their rusted and broken brake handles, trying to muster enough courage to get on one of them. I pulled one of the bikes out, sat myself on top, tipping from one side to the other, and even though I was shaking, decided I could give it a try. We started off downhill and I tried to find my balance for the first couple of minutes. Once we hit the main road, I hoped the cars would be understanding of me, as I did not have much control! It turned out to be a terrifying, yet exhilarating experience, and I was so happy when I came to a stop at Dotty’s! I did it! We headed in for our hamburgers and milkshakes, which were quite disappointing to me. I think we should have gone to Bob’s instead. FunSize ordered us some curly fries and we laughed and laughed while we ate (although he got mad at me for using too many napkins!). Then, we got back on our bikes and headed back. I had to pedal up the hill to start and then manuever through a busy road again. In those moments, I felt more free than I had in a long time! 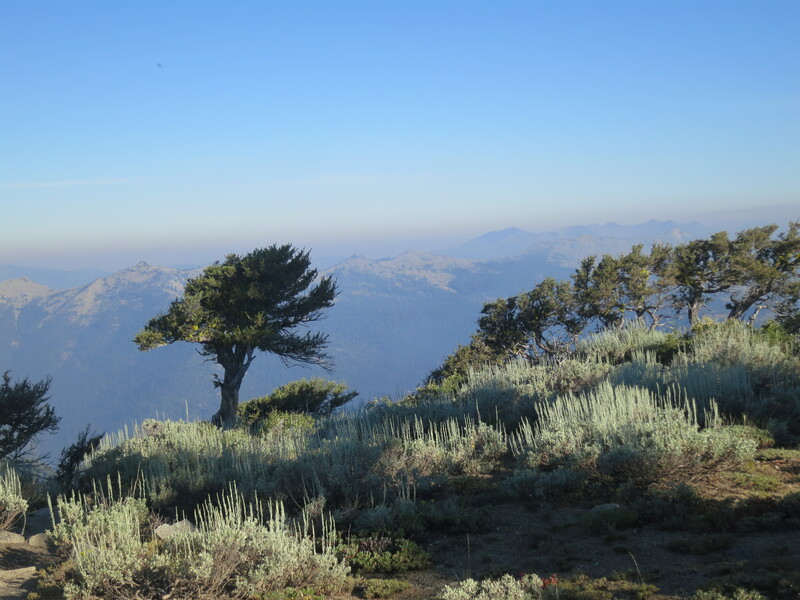 I was overcoming a very long held fear, was moving much faster than I had moved on my own in a long time…and I was out here in the town of Etna and didn’t have to go to work!! I felt so happy! Fun Size wanted to stop at the grocery store and I said I would see him back at the hut, but then he asked why I didn’t want to stop there, too! Okay… The store reminded me of one that my Swiss friend and I had gone into in Northern Italy (not a nice one). Fun Size asked me if I wanted to share a pint of blueberries with him. Sure! I got us each a banana, and then we went to the freezer to pick out a flavor of ice cream. How nice to have someone to share things with!! We headed back to the hut and I began my resupply sorting process. I sat on the porch, which turned out to be a mistake, as the sun was baking me. My energy quickly wilted. Fun Size offered to help me take my things to a shadier place and then sat by me to keep me company while I sorted. When the washer was free, I put my load of laundry in, and then went to the back of the property to set up my sleeping bag. Cookie and Runs with Elk had set up nearby, while the others were staying in the middle of the bunkhouse and our area. Braveheart, Ole, and the others were planning on going to the brewery for dinner, and wanted me to go, too. I felt well-liked at this place! I wasn’t so hungry after the hamburger and milkshake, however, and Fun Size and I needed to eat our snacks that we bought. He was on the phone and I decided to wait to see what he was going to do. We were both torn. Part of us wanted to stay, and part wanted to go. He started looking at the VHS options… Once he heard Siesta and Weebee had made it into town and were at the brewery, he decided that he would go say hi. I stayed and took out the ice cream. I felt like I needed to journal, as well. So many things to do and so little time!! Surprisingly, Fun Size returned not too long afterwards! Oh, Shashinka had returned from his commune visit by this time and had a nice reunion with Fun Size! Unfortunately, being Sunday, the hippies were all having an off-site meeting and Shyshinka didn’t get to observe any of them! We ended up watching “Best in Show” with Cookie and Runs with Elk. I rarely watch movies, so this was something different for me. It was nice to be around people and laugh. Of course, it was well after my bedtime by now and I kept yawning. Braveheart and Funsize slept in the bunks while the girls headed out to the backyard. This turned out to be a great day! I love Etna! 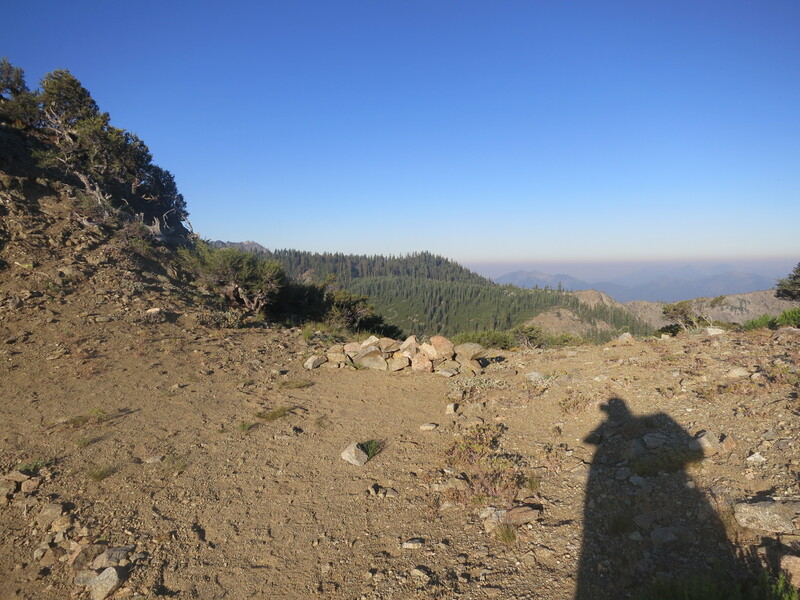 This entry was posted in Uncategorized and tagged Etna, Pacific Crest Trail, PCT 2013 blog, PCT thru-hike by Wendy. Bookmark the permalink.